There's nothing more fun than dressing up your littlest one in an adorable outfit for every holiday of the year. Our collection of Baby Clothing features designs for occasions like Christmas, birthdays, Father's Day and Mother's Day. Personalise your piece with your child's name in their favourite colour. These items are fashion pieces that also hold special meaning and can be a keepsake for parents. With our bright and vivid printing, our shirts result in a professional and fresh appearance that is guaranteed to last. Perfect for all the big milestones in a baby's first year! I purchased a Long Sleeve Baby Onesie for dads first Fathers Day. He loved it! 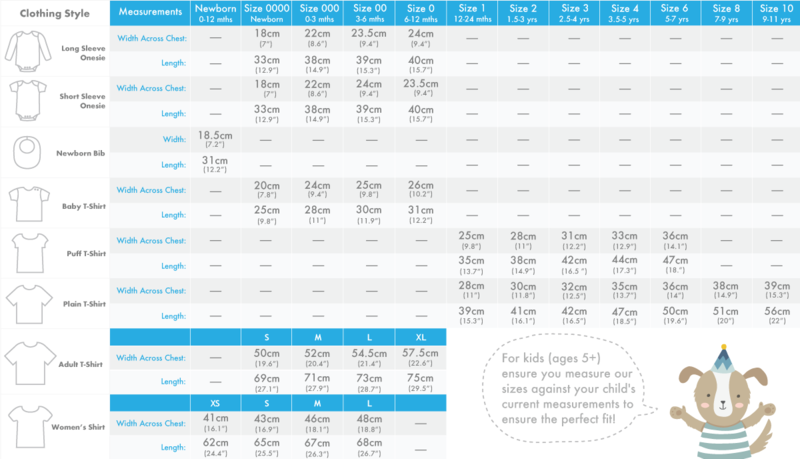 Sizing is true to size which is great as it fits perfectly. Best gift for Mothers Day! I received a Baby Onesie from my 6-month-old son from my fiance and sister. I cried when I saw it, I will always cherish this Baby Onesie! We had some Bibs made for some special people in our lives to announce our pregnancy and they arrived really fast and looked super cute. Thank you! Very cute T-Shirts that arrived extremely promptly! I have ordered a few personalised onesies for my baby and it was so cute, I decided to order a couple for a friend. They loved it and have cute pictures to remember by. Will definitely order more! Bought a short sleeve onesie for my baby's first Christmas last Dec.The quality of the material is good. Great fit and it looked comfortable on her. It's a great memorable piece for her and our family. Loved it so much! I ordered a jumpsuit for our little girl to wear on her daddy’s first Father’s Day and he loved it, just an awesome way to make him feel special being a first time dad!